It was during a very interesting lecture about kit and what combinations work well in cold climates, that I first heard about the Sami people (the indigenous people of northern Scandinavia). We had been talking about increasingly insulating pieces of kit, which in turn become heftier hats and fluffier fleeces, when out slipped a very innocuous and beautiful pair of woollen ribbons of vivid reds and yellows that had been coiled up in a figure eight pattern and had puffy baubles at the end. 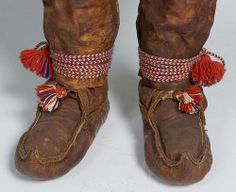 These were shoe bands, used by the Sami, and I was mesmerised by them for many reasons. Firstly, part of their beauty was in the simplicity. They were bands made of three sections: a shoelace thickness woollen braid of about 2 hand spans in length, followed by a woven flat band of two fingers width and 7 hand spans long, followed by another braid of 3 hand spans long with woollen bobbles on either end. They could be hanked up and take up next to no space, fitting into the toecap of a boot. Secondly, I appreciated how absolutely brilliantly they did their job, which is similar to that of gaiters, to keep the feet warm and dry. 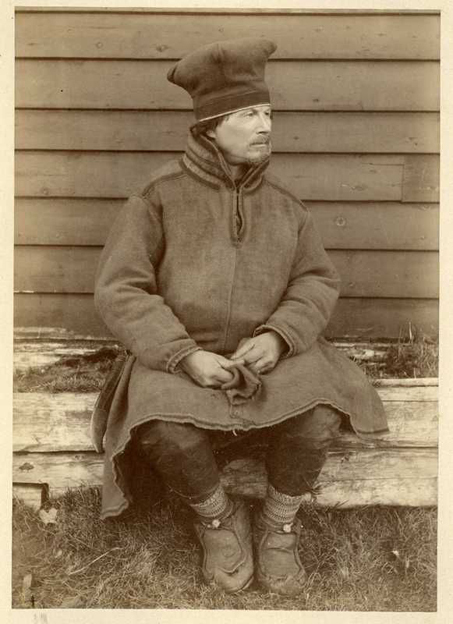 Unlike gaiters, Sami bands wrap around and around the bottom of the trousers so as to seal the trouser leg opening to the boot under a layer of wool to prevent snow and cold air going up the trouser leg. 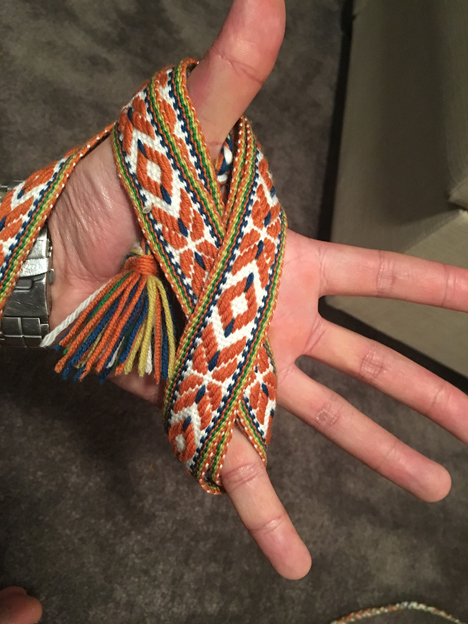 The braid at one end is used to fasten the band to the shoelaces initially, and to tie off the band at the other, with the bobbles helping to secure each knot. As the bands are made of wool, they are insulating, breathable, mildly water resistant, and purportedly actually give off a small degree of heat when wet. They unravel into a long flat band which can then be easily be dried by the fire. Keeping kit dry is key to staying warm, a process that would otherwise be risky with less flame retardant materials. Thirdly, I loved the fact that they were simply pretty little pieces of bright and bold art, with intricate, and as I later discovered, meaningful and beautiful designs, which was a tribute to the skill and elegance of the craftsperson that made them. I was so fascinated by these bands that whilst on the course I constructed a set from old bed linen to test out. They worked surprisingly well. By the end of the course trudging through knee high snow I still had dry feet. 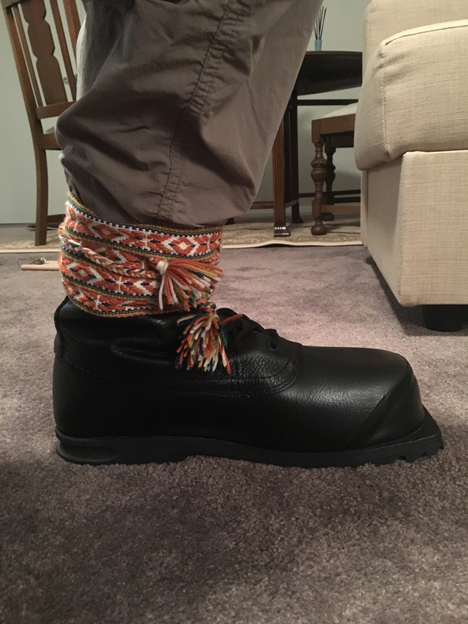 Sure they perhaps took another minute or so longer to tie up compared with putting on gaiters, but having passed my crude test and for the reasons already mentioned, I was very keen to make my very own Sami shoe bands when I got home. There is at the same time limited information about the Sami (much less about Sami bands) but equally much more than you’d expect thanks to the Internet. 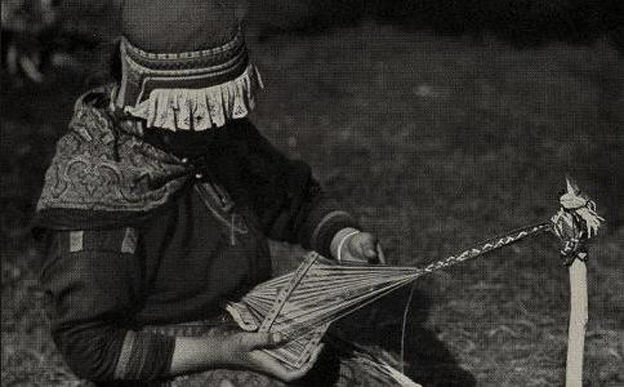 One gem I stumbled across after weeks of idle searching was an excellent no-nonsense book by Susan J Foulkes called “Sami Band Weaving”. I highly recommend this book; which was invaluable in guiding a complete novice through the process of weaving, to produce a convincing version of what I had seen on the course. 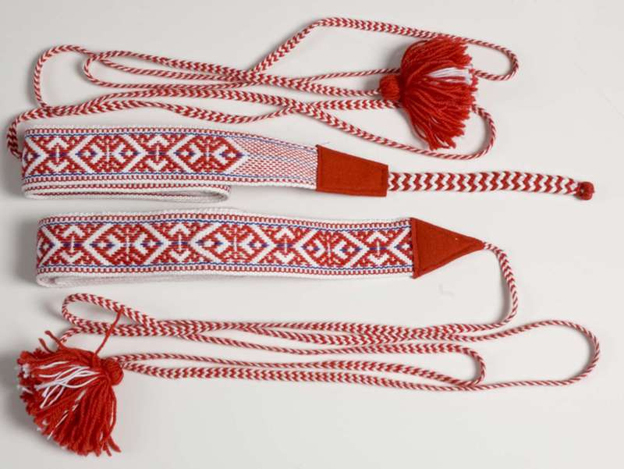 Essentially, the core principle of weaving has remained unchanged since its inception, and so it remains with Sami bands. It requires a series of tensioned threads (the warp), held side-by-side and separate by threading each strand through a comb like device (the heddle). Then a separate thread (the weft) weaves in and out passing back and forth across the warp to create rows of woven material. The process is made easier by attaching the weft to a guiding device, the shuttle (or netting needle when used to fashion nets) which guides the weft quickly through, and doubles as a way to store the weft which is usually quite long and can be unwound to release more as needed. In today’s world you can buy all manner of looms that would make short work of band weaving. 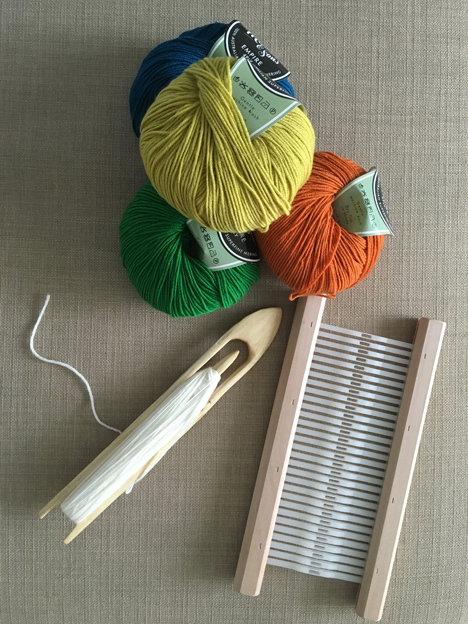 I chose to follow the traditional Sami method which is exquisitely portable, and requires nothing more than a couple of tools: the shuttle and rigid heddle, both of which can fit into a pocket, and can even be carved from nature if needed. I started by carving the shuttle. This in itself was a fun little project and Ray Mears has a great video on carving a netting needle, which is perfectly edited such that it gives just enough glimpses of techniques and guidance without taking away the sense of discovery or achievement of using your knife in a new way. I’m as guilty as the next guy of not always having time to go out into the woods for a carving project, but this really is a 1-2hr project that taught me subtle techniques that the usual wood splitting or tent peg making don’t extend to. 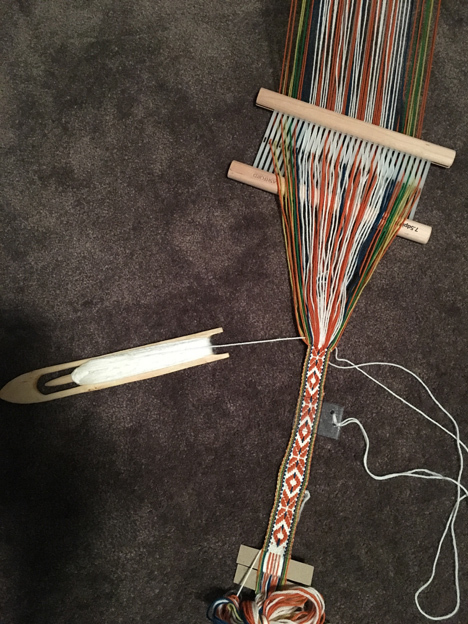 The heddle I bought from a local wool and crafts store. This could also be carved, but I must admit having already bought the book and digested the weaving process, I was keen to start the project so went for the speedier option! I gathered my balls of wool, threaded the heddle according to a my chosen pattern from Susan Foulkes’ book, tied one end of the warp to my belt and the other to the door handle, and sat down to weave! At first everything was slow and painstakingly technical. I’d check every thread, and try and understand the effects of what would happen to the pattern when I deliberately didn’t weave in and out of a few threads of the warp. There are certain key threads, called the pattern threads, that if allowed to float on top of the weave produce a visible colour on the band, or equally can be buried to hide it. In this way, by managing which threads float and which are buried in a pixelated fashion, one can create any pattern on the band. Once I had meticulously checked the pattern threads, I would start to play around with the tension of the weft to see how that affected the neatness of the weave and the thickness of the band, all the while juggling the tautness of the warp. After some interesting dry runs my mind began understanding and relaxing into the technicalities of the weave. No longer having to focus so hard on each component, I found the world around fading out and I would get really drawn into the now slightly automated process; constantly trying to strive for that perfectly consistent and even weave in some calming yet single-minded reverie–not dissimilar and at he same time a funny parallel to how I find myself when washing the dishes! 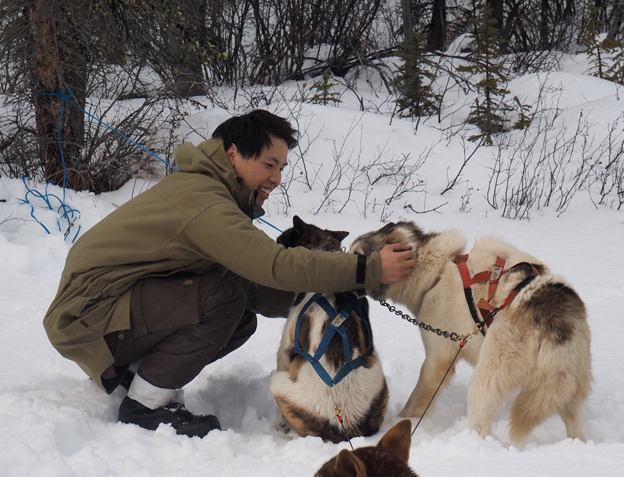 And so I would work on the weaving, fitting in a little bit here and there whenever I could–I even took it camping in the mountains with me one time! I remember working away furiously on it one day. I knew I was close to completing the band and was anxious to see the finished article. I only realised the passage of time as it got more and more difficult make out the individual threads from the fading light. I sat up and arched my back against the ache from huddling over the weave for such a long time, and rubbed my hands against the cramp in my fingers from having to keep an even tension on the weft the entire time. I mused (or rather my grumbling stomach did) about how I should probably get dinner going before attempting the final section and then I began to chuckle. It dawned on me that I was probably feeling the same backache, rubbing out the same stiffness, and thinking the same thoughts as the Sami craftspeople did hundreds of years ago. Here you can see my completed Sami shoe bands It wasn’t so much that I had made what I felt was a beautiful piece of functional craft, but without being too dramatic, it was mostly fulfilling because what had started off as an exploration into cold weather survival, stemming from some childhood ponderings, ended up as a journey to the past and discovering kit that is still so relevant and unchanged due to such remarkable bushcraftsmanship, and getting a glimpse of what it may have been like to be in the shoes of Sami craftspeople centuries ago. In that vein, I’ll end by hoping others may try their hand at a similar journey, and that we all continue dreaming and journeying! @Mosaicthinking: Thanks Mosaicthinking, but really I just conveniently left out tales of my other abysmal attempts from the blog. @OErjan: I’m impressed but equally not overly surprised that Sweden (being notorious for its progressiveness) has the foresight to ensure such a lovely skill and historic tradition is maintained through the generations! I’d love to see how it turned out if you took that class! At school here in northern sweden we can make a headle and netting needle as part of class in 5-6th grade. Great result on your shoe bands. I’m super impressed. I have also had a go at Sami style band weaving but my results weren’t nearly as impressive as yours. Thanks Anonymous! I’m a bit of a digital dinosaur, but finally got around to giving blogging a go. I realise it’s probably considered by most to be a bit of a dry subject…but I’m oddly obsessed with it!